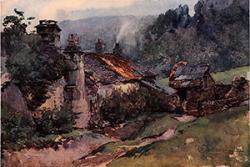 Welsh Cottage by Onorato CarlandHave you ever wondered how others see us? A new public exhibition, drawing on research at Bangor University’s School of Modern Languages and Cultures, looks at how European visitors – including explorers, tourists and refugees – have viewed Wales since the mid-eighteenth century. The exhibition at Bangor’s new Storiel is called EuroVisions: Wales through the Eyes of European Visitors, 1750-2015 and runs from April to 2 July. On display at the exhibition are works by artists from Switzerland, Belgium, France, Italy, Germany, Austria and Poland from the Romantic period up to the present day. The pictures show Wales in all its many facets, ranging from idyllic landscapes to industrial centres and portraits of the people living in Wales. The exhibition grows out of a research project looking at portrayals of Wales and ‘Welshness’ in European travel writing between 1750 and 2010. "Ysbyty Gwynedd" by Karel Lek.The project is a collaboration between Bangor University’s School of Modern Languages and Cultures and colleagues at Swansea University and the University of Wales Centre for Advanced Welsh and Celtic Studies in Aberystwyth. The project is funded by a major grant from the Arts and Humanities Research Council. The three-year project has already identified over 360 travel accounts in which visitors from the European mainland describe their journeys around Wales since the mid-eighteenth century. Euro-Visions complements these accounts as it focuses on works of art that have been inspired by the landscape, sites of industry and the people of Wales. "One wet evening I got there when a Welsh funeral was taking place. The small group round the grave, in a nest of grasses and sheltered by beautiful trees, was singing. How often we owe deep gratitude to people who know nothing of it! For I and the dear companion who was with me that grey evening were moved to soft tears, and never shall we hear better and more convincing music. The Welsh are such musical people." 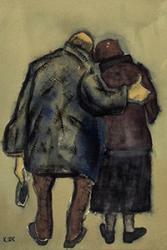 Refugees are one of the most prominent groups of travellers to Wales in the twentieth century and Storiel is also showing an exhibition, Observations, of the work of Belgian artist Karel Lek who took refuge in north Wales in 1940. 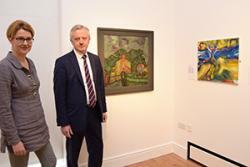 The paintings on show give a unique view of one traveller to Wales and his take on the community which welcomed him. In keeping with the spirit of the project, the exhibition is itself traveling around Wales and has been to Aberystwyth and Swansea before making its final stop here in Bangor. Both EuroVisions and Observations run until 2 July.